One of the desert regions in Mexico, in the state of San Luis Potosi, is considered sacred to the indigenous tribe called Huicholes. They call the region “Wiricuta” or “Huiricuta” and it’s just North of the city of San Luis Potosi and even closer to the town of Matehuala. There’s a popular tourist town up in the Sierra Madres that line the desert below called Real de Catorce. Wiricuta is the desert below. One of the nearby mountain peaks, maybe an hour hike on foot from Real de Catorce, is called “Quemado” by the locals. The way it was explained to me is that the very first Huichole saw the very first sunrise coming up over Quemado. The Huichole believe that the head of each family must make a pilgrimage through the desert and up to the peak of Quemado every 3 years for peyote rituals. They believe this practice must continue in order for the Sun to continue to rise. 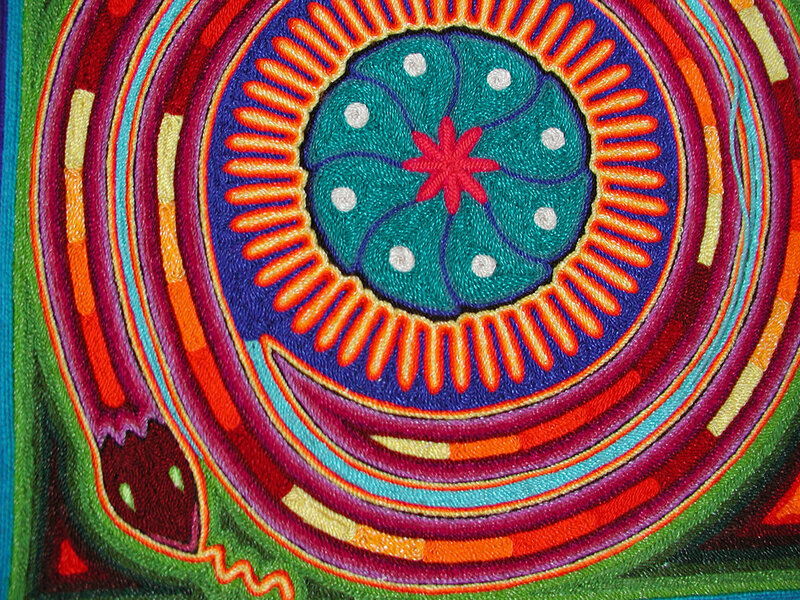 Peyote is used along the way and these colorful god’s eye crosses made of wood and colored yarn are placed at different points along the sacred route. This practice has gone on for possibly a couple thousand years. In the past, the journey would be made on foot all the way from the Nayarit region where the Huichole live. Now most of the journey is taken by bus and the last week or so on foot. I’ve never participated in one of the Huichole ceremonies, but I have come across the yarn crosses they leave along the route. I’ve also visited the ceremonial grounds above Real de Catorce, atop Quemado. There are several primitive concentric circles made of stones and many more of the yarn crosses left behind. Often they have a photo of a loved Huichole, children, etc. and some pesos and candles left behind. I believe they carry the prayers of the loved ones up to the ceremonial site and the objects as offerings. I’m not an expert on Huichole tribal and spiritual culture, but having gone to the sacred Wiricuta myself on several occasions, one hears lots of stories. The first time I went there was back in 1994. Another backpacker from Austria had told me about it. Or, rather… a couple of years after we’d met on the road, he sent me a photo of himself in this desert. There was a peace about him in the photo. He was just standing out in this dry expanse with mountains in the background, a simple Mexican poncho, a wooden staff, and he looked dusty. Not long after the letter and photo had arrived in the mail, I heard from him. It’s been a long time now, but I think his name is Gerard. He was passing through Texas on his way to visit other places in the U.S. and contacted me to see if it’d be cool to visit. Gerard only stayed a few days, but before he continued on his journey, he gave me instructions on how to get to a place in the desert called Wadley. And, he told me to ask for an older local man, Don Tomas. Gerard said to mention his name to Don Tomas and he’d fix me up. I’d been to Wadley several times when this particular story takes place, and Don Tomas did indeed fix me up. Every time I returned to Wadley I’d go straight to Don Tomas’ house for a key to one of the several rooms he rented to backpackers. He had a couple of enclosed compounds with around a half dozen basic rooms with a smooth concrete floor, tin roof, metal door with padlock, and a shared toilet that you have to fill up a bucket and dump into the commode to flush. Basic. Don Tomas also had a few rooms next to his home as well, and pretty much all of the walls in his rooms were adobe. On this particular visit, I stayed in the compound just above Don Tomas’ place, on the other side of the only 2-lane road that extends the entire length of Wiricuta. All of the half dozen little villages along the road were there basically as depots for the train that also runs the entire length of Wiricuta. The upper compound is a bit further from the train track and pretty much on the very outskirts of town. The lower compound is interesting in that it’s right in the middle of town, where you can hear all of the sounds of life there. And, it’s closer to the little tienda stores where you can get snacks, water, candles, etc. However, the lower compound is only a few meters from the train track. When a locomotive comes barreling by, the force shakes everything violently. The train whistle sounds like it’s right there in the room. You do get used to it after a while. I sometimes prefer the lower compound because of the sounds of life, and the train reminds me that the rest of the world is still powering along, while time feels like it stands still in Wadley. Sometimes there are a handful of other backpackers there too. Whether that’s a good thing or not, is often a roll of the dice. You can end up with some loud partiers who don’t clean up their messes and are up all hours of the night. Or, you can end up with a quiet group that you get along with. Other times I’m completely by myself. Each compound has it’s own little kitchen or cocina. It’s a bit generous to call it a “kitchen”. There’s a small gas stove, that if you’re lucky, Don Tomas has paid for a fresh tank of gas. There’s a scattering of various pots and pans, plates cups, utensils, etc. If you’re extra lucky, the last people there might’ve cleaned them all up. If you’re not so lucky, they’re all stacked up with varying degrees of food decaying. If it’s all dirty, I’ll usually clean it all up once and grab a cup, plate, spoon, and a small pot to boil my water for coffee. I’ll keep this in my room for the duration and clean them up again before I leave. Don Tomas had first taken me to the lower compound, but I spotted a fair amount of empty cerveza bottles strewn about, some bongo drums, and a beat up guitar leaning on one of the room doors. Looked like a party. I asked Don Tomas what the situation was like at the upper compound. He said it was empty, except for Philipe. He said Philipe is French and pretty quiet. Done! Vamanos to the upper compound then. These compounds are kind of a hodgepodge of repurposed rooms. I think the rooms in the lower compound were at one time stalls for pigs. I’m not sure what the upper compound was originally used for, but it was likely not built for housing backpacker peyote-eating hippies. The upper compound had a large storage room with a huge table and a bunch of junk. Don Tomas had shown me the other available rooms, but I asked if I could stay in the large storage room instead. I told him I saw a bed in there and I’d clean it up since I’d be there a couple weeks. He said that’d be fine but was trying to tell me something about the room to beware of. My Spanish has never been completely fluent, and Don Tomas slurs a lot… likely due to a lot of missing teeth. The first thing I finally gathered was that he was telling me to be wary of police. That they’d been visiting off and on. That there wasn’t any reason to be worried, but don’t bring any peyote cactus in from the desert. The second thing he was warning me about, I didn’t comprehend until later when the train came through town. Don Tomas was telling me that when the train comes through, it vibrates fine dust from the tin roof that falls like snow for a few seconds. Not ideal, but tolerable. Don Tomas helped me push some of the junk into the corner, and he gathered up most of the garbage and swept the floor. I organized some of the storage to make more room and made the bed that was in the corner of the room. By the time we finished, I had a large empty table all to myself, and at least 3/4ths of the room cleared. After we’d decided it was cleaned well enough, Don Tomas took off to tend to his goats and I went to check out the kitchen situation and hopefully score myself a good cup, spoon, plate and boiling pot for the duration. I noticed the door to the room Don Tomas said Philipe was using was open and I could hear some music playing. Decided to introduce myself. Philipe was lounging on his bed reading while puffing on a long skinny pipe. After introductions, I asked him about the strange pipe. The name of the pipe I couldn’t understand, but he said it was a special pipe he got in Morocco for smoking “kef”. Didn’t know what that was either. He pulled out a small bag that had a bright green powder in it and filled the tiny bowl of the pipe. I asked if it was similar to marijuana. Philipe said it was the same plant but a refined variant of just the most potent portion of the plant. He lit up the bowl and asked it I wanted any, but I declined. Told him that I would like to try it, but later on after I got all situated with buying some fruit, water, candles etc. Explained that I have a very low tolerance to marijuana and tend to get way too high very quickly. Later that evening I saw Philipe chilling out in the compound kitchen with a coffee, a little portable cassette player, and his long, skinny exotic kef pipe. I’d just treated myself to a bottle of Mexican Coca-cola from the tienda and thought perhaps I’d have a seat at the table and see what this strange “kef” substance was all about. My room was all situated nicely for the next couple of weeks, I didn’t need to interact with anyone else, and my bed was only about 30 paces away. It was very easy to smoke. Didn’t take much either, at least for me. Generally, I don’t much care for the cloudy effects of partaking in this sort of smoke. The paranoia, confusion, and the hit your short term memory can take are not so pleasant for me. The relaxing part can be quite nice if I don’t over do it. The sensation from smoking Philipe’s kef was different than what I’d ever experienced before. I late discovered that Philipe was also quite the expert in high quality cannabis products, so this was likely of the highest grade. Strong for sure. Very strong. Though, I don’t recall having all the paranoia or confusion. It was more of a focussed cerebral experience where I felt like my brain was operating just fine, but on a higher level of plane. I can’t remember how long we talked, but I never felt like I was “out of it”. Perfectly engaged and we traded stories most of the night. It must’ve been near 3AM when we finally decided to call it a night. The next morning, there wasn’t a cloudy feeling or anything. Mind was clear and more focussed. Normally, for me it’s the opposite and why I typically will abstain. I guess there’s something to be said for the quality of being absolutely pure. The next day our quiet compound was invaded by 3 college-age guys from Mexico City, “Chavos”, slang for city boys. The compound has a large metal door that you can drive a vehicle through, and the new neighbors pulled their red Ford Fiesta right into the middle of the compound. They all three looked pretty stoned and like they were there to party. They tossed out 3 large backpacks onto the ground that were mostly empty, other than sleeping bags and they went to the tienda to load up on drinking water before hiking into the desert. Seemed odd that they didn’t seem to be carrying much in this huge backpacks, but you really don’t need much out in the desert anyway and knowing they were as least taking the party out into the desert was a relief. Chatted with Don Tomas earlier in the morning when I was on my tienda run for some instant coffee. I’d seen a police truck parked at one of the shacks that doubled as a make-shift bar. Mentioned the sighting to Don Tomas. There was an old jail house in the town that appeared to be abandoned every time I’d visited, but maybe it’d been recommissioned? Don Tomas told me not to worry. That the policia were only making rounds of the desert for someone to shake down. He said there were all corrupt, but that those 3 policias were the only ones in the entire desert. Don Tomas said their station is in the next town Estacion Catorce. Backpackers often either hike down the mountain from the touristy town of Real de Catorce near Quemado to Estacion Catorce, or they take a taxi jeep. They call the jeeps “Willy’s” because that’s their brand I think. The 3 cops stay scarce until they see the backpackers coming back into town form the desert to catch a Willy back up to Real de Catorce. Then, they surprise them with a body search. If they’re carrying any peyote cactus, it’s a 50 peso fine for each plant. Pretty good extra drinking money, especially with the weekend approaching. Don Tomas said he they show up in Wadley only if they haven’t caught anyone in Estacion Catorce in awhile. He also said not to worry about it. That they won’t bother you unless they can smell marijuana or think you’ve just come back from the desert. Then, they might search you. I thanked Don Tomas and headed out into the desert for a little hike. There’s a place I like to go that’s easy to get to. Well, everywhere is pretty easy to get to, it’s all mostly flat. It’s the thick patches of cactus that make some areas a little more tricky to get to. Many of the cactuses out there have needle-sharp thorns that can be as long as 3 whole inches and can pierce all the way through your hiking shoes into your feet it you hit them just right. The spot I like to go to usually has plenty of peyote cactus growing near by, a scraggily mesquite tree for a little shade, and sandy paths leading right to it that the goat herders use. You’ve still got to watch out for stray cactus thorns, but it’s much easier than hiking straight through the brush. On any given trip out into Wiricuta, I’ll just take off in any ol’ random direction and keep walking for hours. You can’t really get lost because you can see several kilometers in any direction no matter which way you go. This time I just went out to my mesquite tree location to inspect how much peyote was out in the general vicinity this time. It varies. Sometimes it’s all over the place, and other times it requires a longer search. There was plenty, but I also noticed this other plant I’d never seen before. I’d heard of it, and only knew that it looked similar to peyote, but it’s meet was more pinkish purple inside instead of the light green of peyote. It’s called “Peyote Brujo” and reportedly very strong. I’d been told that only shaman’s mess with it. I pulled out my knife and cut into the top a little to reveal the meat. Sure enough, it was pinkish purple. Wasn’t sure if I wanted to risk experimenting with an unknown like this, but was thrilled to have finally found some. I cut it out of the ground and into small pieces and bagged it so I could hide it easier in case I happened to see those policia poking around on the hike back to Wadley. Didn’t know how it was supposed to be consumed yet either, but I knew one of the other backpackers in town would likely know. Back at the compound I showed my find to Philipe. He’s more knowledgeable about the cultural specifics of the Huichol Indians. He had even talked the University back in France into financing his whole trip as “research” for 3 months. I believe he was studying the sociological effects on indigenous cultures when they’re exposed to foreign tourists… or something like that. Philipe confirmed I’d indeed found some Peyote Brujo. He said he’d never tried it before but that it was known to be very powerful and not to be trifled with. Said pretty much only shamans use Peyote Brujo and that they typically dry the cactus pieces first, grind into a powder, then it’s smoked. I hadn’t decided if I’d risk experimenting with it yet. But I figured I could at least prep it just in case I was game or wanted to pass it off to another backpacker later.The climate is so dry in Wiricuta that it wouldn’t take any time at all to completely dry the cactus. The center of the cactus was full of fine white fiber that you have to clean out first, just like the regular peyote plant. It’s almost like a coarse fibers substance and there were bits of it all over the floor I’d just swept out. I found an old primitive ladder that looked like someone had crafted it themselves from mesquite and I climbed up to place the cactus pieces on the roof of my room for the day. Philipe asked if I wanted to join him for a little hike into the desert. I’d just come back but he wanted to explore an area I hadn’t been to yet. He said there was a nice grove of trees out there that also had soft green grass in the shady parts. Called it an “oasis”. There are a few areas like this in the otherwise bone dry desert, but they’re rare and a bit surreal when you find them. I told Philipe about the policia that I’d seen and the warning Don Tomas had given. He’d already seen them too but wasn’t too worried about it. As we walked along the sandy trail, Philipe told me about a few details regarding the Huicholes peyote culture. I asked about the significance of how many sections counted atop a peyote cactus. When you look at the top of a peyote cactus, there are these little sections with tufts of that white fiber that has to be cut out too. I’ve heard that the white fiber has a small quantity of strychnine in it, and that’s part of what makes you sick, but I’m not certain that’s true or not. He did say there was significance, but I wasn’t sure how much of what he said was hippy backpacker hear-say… basically made up or imagined while high, or actual Huichol culture. Perhaps there isn’t really a difference. I told him that for me the number 13 was significant as was the number 7. Philipe said that 13 sections meant that the plant is a “maestro” or teacher. I added that in magic mushroom cultures, they tend to assign different significance to the number of mushrooms and physical characteristics of the individual mushrooms too. The longer-stemmed derrumbe mushrooms in the mountains of Oaxaca, Mexico are also called “maestros” as well. The cap of these is generally more bell-shaped. The conversation was going on like this until we reached the oasis Philipe had told me about. I could see a thick grove of mesquite trees ahead of us. It hadn’t rained in awhile, so everything was covered with a layer of dry fine desert dust and the grove blended into the landscape fairly well. I couldn’t see them at all until we were just a few meters from them. As we approached a clearing in the branches, I could see bright green grass in the shade. Philipe stepped over toward a shrub to take a leak. I was amazed at how green the grass was in such a dry terrain and then looked down at the ground before me to see where the green grass began. Directly in front of my feet was a peyote plant, of the size I’ve never seen before. Philipe walked up as I knelt down to brush away desert dust to get a better idea of just how large it was. It had to have been close to 11 inches in diameter. Usually they’re around 2-4 inches. Philipe walked over and was awestruck with this gargantuan peyote plant. “I just noticed it at my feet. I’ve never seen one that big. Is it actually a peyote plant? Or, maybe just a cousin that looks like it? After brushing most of the dirt away and digging a small trench around the edges of the mammoth peyote plant so that I could get my knife underneath it to cut, I liberated the entire cactus head in one large piece. After you cut the top part off, you push the dirt back over it so that it’ll grow more. The root of the peyote plant goes down a good ways and they’ll continue to grow another head if you leave the root intact. Philipe asked if I was going to leave an offering of gratitude for the plant. I’d seen this done before, but I’d never left anything before. It was midday and the sun was intense. We walked over into the mesquite grove and sat in the shade on the soft green grass for a little while. We laid back and stared at the blue sky through the mesquite grove canopy. Compared to the hellish white-hot sun that had just been making me feel a bit delirious… the grass was soothingly cool to the skin and felt heavenly. I drifted off halfway to sleep for about a half hour. Not a full sleep, but that state in-between full sleep and kind of dozing. Completely aware of the cool grass, the sun flickering between the mesquite tree branches above, and the breeze. Yet, I wasn’t completely there. Philipe got up first and said he was going to start walking back to Wadley. He wanted to know if I was ready to go back too. I told him that I’d packed a hammock, oranges, and plenty of water. Said I might try to eat some of that giant peyote plant and chill out in my hammock for the afternoon. Philipe looked amused and laughed. Philipe headed out of the oasis and I found a perfect set of branches to hang my hammock from. I sat back down on the grass and started cutting up the monstrous plant. I halved it and thought maybe I could stomach that much. Peyote cactus has a very bitter taste, even after you’ve cleaned the fiber out of it. The oranges are used to help kill the taste so that you can get it down. After you get used to the taste, you can make due without the oranges, but I’ve rarely progressed that far. So much easier with oranges. I put a piece of the monster plant in my mouth along with a wedge of orange and started to chew. The taste of this one was stronger than I’d ever experienced and it was a challenge even with the orange. I don’t think I made it through half before I couldn’t eat any more. So, I wrapped up the remaining 2/3rds of the peyote, put it in a yellow plastic bag underneath my remaining oranges, and dropped it into my daypack. I laid back on the grass and resumed my zoning out to the magnificent blue sky above, waiting for the plant to digest. About a half hour later I got some stabbing cramps in my gut. This had never happened before. Very sharp pains that didn’t subside. They only got more intense and felt like I was digesting broken glass. Add to that, the peyote was starting to get to my head. This wasn’t good at all. I felt deathly ill and was clutching my gut, writhing in the grass in pain, and my mind was taking off into the stratosphere on mescaline. Not a winning combination. I managed to get to my feet and slung myself into my hammock to ride it out. Having your brain hemispheres open up like a fleshy lotus and expose it’s pink insides to a shower of electrified comet sparkles is fine and good, but if you also feel like you’re trying to pass the cutting shards of a giant mason jar though your small intestine... no amount of comet sparkle can make that tolerable. Desperately wanted to be back in my room and closer to someone who might be able to help, like perhaps a doctor for example. Though, I don’t believe there are any doctors in Wadley or nurses for that matter. The closest medical attention would be a couple hour bus ride to Matehuala, and that’s after the hour-long hike back to Wadley. Provided, I could get back before the only afternoon bus left at 3pm. So, I gritted my teeth, clutched my stomach, drank as much water as I could tolerate without throwing up, and tried to enjoy the psychedelic realms in my hammock... between the shooting pains. Didn’t keep track of how long the pain lasted, but I’m guessing it was the better part of 4 hours since the psychotropic effects of the peyote were starting to subside a bit. It usually last for anywhere from 6-10hrs depending on various factors. I felt like I could finally start hiking back to Wadley at least. In flat, desert areas like this on, it’s always difficult to judge distance. I hadn’t paid attention to exactly how long Philipe and I had hiked to the oasis, and although Wadley looked to be only a half-hour or so away… it took me well over an hour and a half to get back. That could’ve been because I changed the route a little to give more time for the peyote to wear off so that it wouldn’t feel as awkward interacting with anyone I might run into in the town. When I got to the 2-lane road that runs all the way through this desert and along the railroad tracks, I was almost at the outer edge of Wadley. I could smell the scent of marijuana burning somewhere. That’s not entirely unusual in this area, but it smelled very strong… as if someone had just walked ahead of me smoking a joint and the smoke was still hanging. My intense stomach cramps had calmed down almost completely, but the effects of the peyote still very much had my brain in an ecstatic state. Thought about stopping at a tienda shop to get something cold to drink and maybe some snacks before walking back to my room, but decided to go lay the bed for a little while until the peyote had worn off a little more. I was almost to the compound and noticed a white truck parked at the compound gate. Looks like Don Tomas has more guests. They must be waiting for someone to open the gate so they can pull their truck into the courtyard. Got a little closer and noticed it wasn’t just a white truck. It had “POLICIA” painted on it. One of the local boys was talking to the cop who looked like he was in charge. He had a stark look, with a bushy mustache and he looked like he was looking for someone to extort money from. I took a hard right toward another tienda to disappear into, but I was too late. The boy had already pointed toward the gringo walking into the nearby tienda. I could see the cop starting to walk toward the tienda and my heart started to race. Think fast! Oh, no… I left that bag of dried peyote brujo in a clear bag on the bed and there was still that white fiber stuff all over the floor. And, 2/3rds of that giant peyote plant was still at the bottom of the orange bag in my daypack. This isn’t going to go well for me. Think, don’t panic. Don’t look nervous. Walked out of the tienda and rounded behind it toward my room. I could tell the cop was picking up his pace and trying to catch up to me. There were two other cops at the truck with the 3 young Mexican guys from Mexico city handcuffed in the back. Evidently, the guys from Mexico City been walking just ahead of me on the road smoking a joint. The cops smelled it and searched their backpacks which were all 3 full of cut peyote plants. That explains why they went out into the desert with almost nothing in their packs other than something to sleep with. Unfortunately, they hadn’t got the memo on not smoking weed in town while the cops are snooping about. I grabbed my passport and stuffed my wallet between the mattresses too before stepping out of the room. The head cop flipped through my passport and then started checking my visa to see if it was expired and had then proper stamps and signatures. One of the other two cops motioned toward my daypack I’d set down. I remembered the rest of that giant peyote plant in the bottom of the plastic bag of oranges, I tried not to look nervous as I handed my daypack to the other cop. He started taking items out slowly, then glancing up at me to see if I was starting to break a sweat as the cop with the mustache went over my papers. When he pulled out my knife that still had some dirt on it, his eyebrows went up. He opened the knife as he stared at me as if he’d found something incriminating. I shrugged. The cop then opened the knife and compared the length of the blade to the width of his hand. Evidently that’s a measure of how long a knife blade can be on your person. It was slightly over the allowed length. I silently relaxed because I thought the dirt on the knife was giving me away. Then, he lifts the the plastic bag of oranges out of the daypack and my heart sank. Still, I kept calm on the outside. The plastic bag was opaque so you couldn’t see through it. He simply patted on the plastic bag with the knife and said, “Naranjas” (oranges). He then puts the bag back into the daypack without looking into it, and folds the knife. Everything went back into the bag and he hands it back to me. Whew! The mustache cop handed my passport back. I tried to make conversation and asked why the third cop was. They said he was getting the keys to the boy’s red Ford Fiesta car because they were being arrested and driven up to the jail in Real de Catorce. Felt bad for the boys, but they were mostly smiling. They also looked very stoned, so maybe the gravity of the situation hadn’t quite hit them yet. Still, I was rejoicing silently inside that I was about to avert this trip going very badly for me. He followed me into the room. I tossed my daypack to the middle of a long table in the room so it didn’t look like I was trying to hide anything in the bag they’d just searched, and then calmly sat on the edge of the bed while started looking around. He looked toward the laptop and looked moved some loose items around looking underneath as he moved through the room. He started kicking his police boot around the floor and moving the white fibers from the peyote brujo that were still there. My pulse went up a few notches. He then walked around the room another time, looking into dusty storage boxes and over to the folded mattress on a rollaway bed where I’d stashed the bag of dried peyote brujo pieces. He rolled it around once. The mattress was filthy so he didn’t stick his hand into the fold to check. I’d heard that another movie had filmed up in Real de Catorce a couple years prior and it had infused a lot of money into the town. Brad Pitt and Julia Davis are in it. I think it’s called “The Mexican” or something like that. Anyway, I knew that the primary motivation for the cops in the area, and most of Mexico for that matter, seemed to be making a little cash on the side. And, I needed to think of a way to distract this guy quick as he headed back over toward the folded mattress after running his hand underneath the mattress on my bed. I remembered that I’d recently had new business cards made and I’d put an icon of a movie reel on them, along with a camera, and a couple others. The reel would make it look like I was really a filmmaker. Walked over to the table to get a card our of my wallet and motioned for him to accept it in order to divert him from proceeding toward the folded mattress. He studied the business card I’d handed him. His eyes lit up as he looked up from the business card. I started walking toward the door where the other 2 cops were waiting with the 3 Mexican guys in the back of the truck. The guys weren’t smiling anymore as I think the high was starting to wear off and they realized what was happening. The third cop had loaded their belongings into their Ford Fiesta and had just pulled it out of the courtyard. As I stepped outside the room the mustached cop luckily followed behind. The other cops asked the mustached one if I was clean. He told them I was only working on a movie and wanted to hire him for security. I waved sympathetically toward the guys in the back of the truck. They half-heartily waved back and cracked nervous smiles. They’d probably be fine. The cops would likely keep their car and whatever mordida (bribes) the cops could get their parents to send, and they’d be on their way in a few days. As the police truck pulled out leaving a cloud fine desert dust hanging int the air, it was followed by the 3rd cop in the boy’s Ford Fiesta. He rolled down the window and cranked up the stereo and started banging his head along to whatever heavy metal music the boys had last been listening to while pretending to sing along. I could still make out the expressions of the boy’s faces. Their high had definitely worn off and they did not look amused. Went back into my room after first giving the stink eye to the little boy who’d first spotted me and pointed my way as I walked in from the desert. He laughed at me and ran off. I stood in my room shaking for a few moments realizing how close I got to ending up in the back of that police truck too. I didn’t have anyone to call who’d bail me out and it definitely would not have gone well. “No, luckily I heard them march the Mexican guy’s in here to get the keys to their car. There’s no where to hide anything in these rooms so I jammed my bag of kef and pipe up above the roof beam and tin roof. Luckily my main stash is still in a pack I have a Don Tomas’ casa. Told Philipe everything that had just happened. About the peyote brujo bag on my bed, getting searched, and about promising to hire the head policia as security on a movie set. Philipe couldn’t believe it. Philipe asked if the police were still in the town. I told him they’d left and were on their way up to the police station in Real de Catorce with the boy’s and their car. He pulled the bag of kef down from the roof beam, along with his special kef pipe. Philipe shook his head in disbelief and headed out to catch the bus into the larger town of Matehuala a couple hours away. He’d be back in the morning. Pulled the bag of peyote brujo from the folded mattress and spread the pieces out on my rooftop again to dry out a little more and just in case anyone else wanted to snoop around my room again. My head was in a pleasant haze from the kef we’d smoked, and I was getting a second wind from the Yerba Mate tea. I refilled my water, cleaned my knife, put on my headphones and headed back out into the desert to harvest. I still had at least 3 hours of daylight left. It was a beautiful day with some nice clouds streaking near the horizon. If I timed it right, and was lucky again in my search, I’d be able to take in yet another incredible technicolor desert sunset on the hike back.